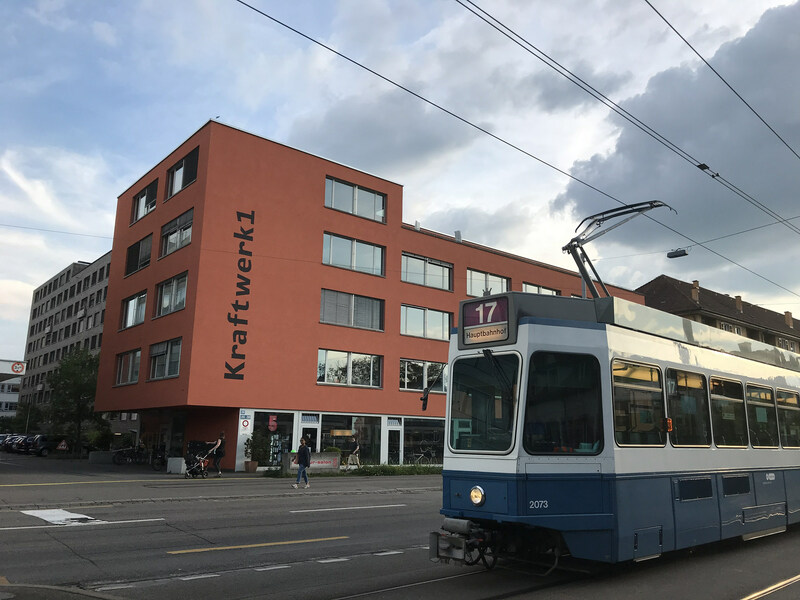 May 2018 saw the MAZI consortium convene in Zurich to see the home of the Kraftwerk1 pilot study and share ideas and practices, as we move into the final six months of the project. We first met in the new community space, L200, that Nethood colleagues Thomas, Ileana and Panos have been instrumental in setting up. A converted shop in District 5, right in the centre of town on Langstrasse, a main street, L200 has been activated as a neighbourhood hub: “[a] stage for local and neighbouring Zurich (small) businesses, a laboratory for start-ups and bottom-up companies, space for social and cultural commitment”. 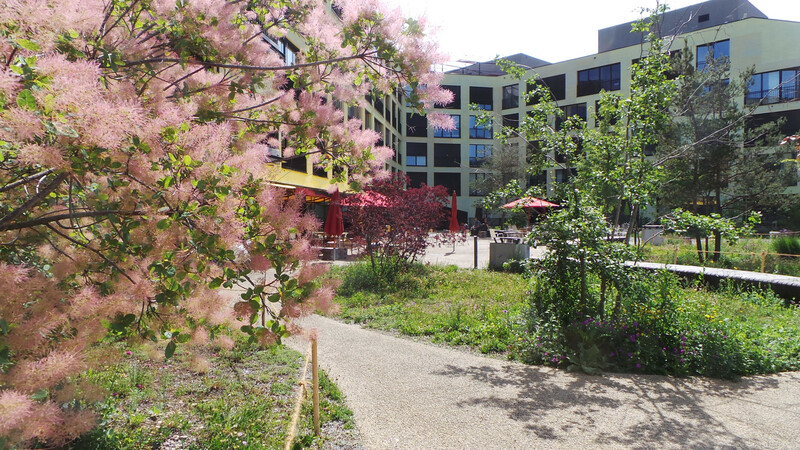 Just opened the week we turned up, it provides a great meeting place. It was a very fitting space for the MAZI team to come together and talk about our interdisciplinarity work. 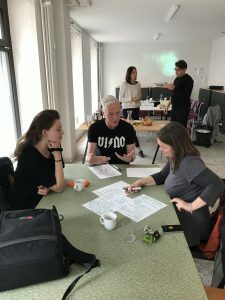 Over three years, we’ve worked as a varied group of practitioners and academics from across Europe and different disciplines to make sense of DIY networking, in four very different pilots. We’re reflecting on the processes, as well as seeking to develop a framework that might guide others aiming at “creating a mutual understanding of basic assumptions, world-views and methodologies” that might be used in similar projects. We broke up into groups to discuss: Roles, Guises and Action Fields; Tensions and Conflicts; and Strategies and Tactics. It’s clear that working sessions like this, are really valuable in giving us time to work together and reflect on challenges and how we might move forwards, with the goal of moving from interdisciplinarity (moving beyond your own discipline to take on board other disciplines’ approaches), to transdisciplinarity (seeking to draw together different disciplines into a new unity beyond disciplinary approaches). Philipp (INURA) then hosted us and acted as the bar tender at a lovely evening reception in the legendary Pantoffelbar at the Kraftwerk1 housing cooperative. T hursday started with a tour of Kraftwerk1, with Philipp guiding us through the history and across the buildings of the inspirational housing cooperative that hosts our third pilot study. 25% of Zurich housing stock is owned on a non-profit basis and Kraftwerk1 is part of the “young cooperatives” movement that sprung from radical thinking by architects, geographers and planners in the 1980s, who also formed the International Network for Urban Research and Action (INURA). Zurich, as well as the home of banking, has a strong collectivist and counter-culture movement. It’s clear that many of the struggles and opportunities we are encountering in DIY networking have a long heritage of being debated and enacted through the actions of housing cooperatives. Local initiatives in both movements have struggled with a range of existential challenges that have commonalities: how to get started, how to keep going, how to inspire and support members, how to deal with legal frameworks and so on. MAZI can learn from the practice and theorising that’s taken place in Kraftwerk1 and elsewhere. In keeping with our Do It Yourself philosophy, lunch was in the community garden next to Kraftwerk1, and we were taught how to make and cook our own pizzas- lovely! After a leisurely and yet productive lunch conversation that included housing cooperative thinkers and activists, we were then treated to a tour of the gardens by Lolo, the caretaker and manager. We then moved into a discussion of MAZIzones and open space projects, and it was clear there were parallels between the Zurich situation and those of Berlin, Deptford and the UnMonastery actions in Greece. 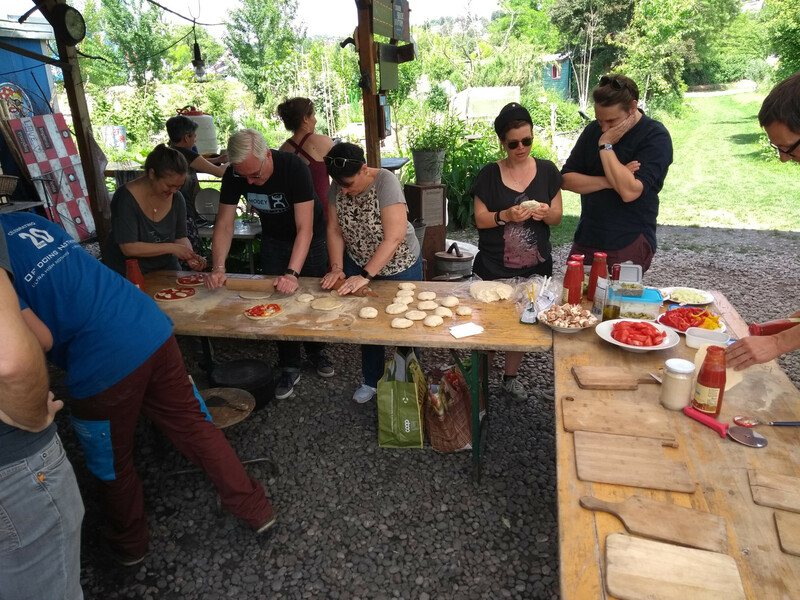 Continuing the themes, Kraftwerk1 hosted an evening session on cooperative housing in Europe, with experiences from participants in new projects, and another DIY culinary extravaganza hosted by our very own Ileana (Nethood). Friday started with a tour of the spectacular Kalkbreite housing cooperative , built over a tram depot, with a further opportunity to reflect on the parallels between collective actions in housing and self-provisioning of ICT tools. We then moved back to L200 for discussions about the INURA Coope rative initiative, and collective learning processes and common space. The final afternoon session drew back more closely into reflections on technology focussed hybrid spaces, with a discussion on cooperative technology and the rights to the hybrid city, again with inputs both from MAZI colleagues and cooperative and technology practitioners from Zurich and beyond. I was struck at how well the two groups overlapped in interests and practical experiences. In summary, the MAZI cross-fertilisation event again proved to be a fantastic experience enabling us all to understand the local context of a MAZI pilot. It also provided an opportunity to bring the consortium together for both structured and informal conversation amongst ourselves, along with activists related to the thematic focus of the particular pilot, to consolidate our work so far and offer insights that might be carried forwards.